The dining area can comfortably seat ten adults. 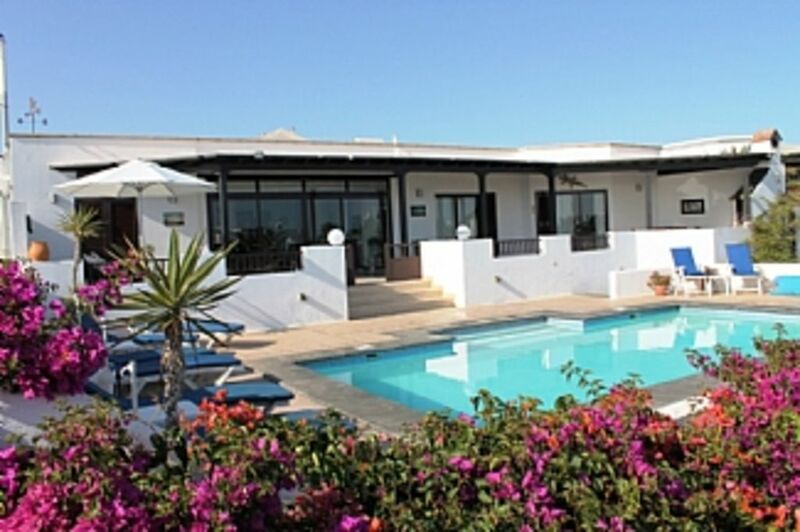 The lounge has floor to ceiling sliding glass doors facing south and leads onto the patio areas which has extensive views to the patio; pool area including stunning views to the sea and to Fuerteventura. The stunning comfortable lounge has seating for ten adults with a large Smart TV including an abundance of UK channels including sports; news; films; soaps; documentaries and children's channels. The Wi Fi and internet facilities are free of charge as is the heated pool. The lounge is air conditioned the use of which is free of charge. If you are looking for something special, Villa Coco has it all. We are pleased that so many of our guests decide to return to our villa for their holiday and as you can see from checking guest comments on 'TripAdvisor' you can understand why the continue to return to our villa. We as a family have owned this villa since 2002 and substantially increased its size, bringing the furnishes finishes up to modern day standards, whilst retaining a place where our guests feel at home. We make sure with our team that our guests are very important and go out of our way to try provide any special needs the may require, be it to celebrate a special birthday; anniversary, or just a surprise for a family member our guest. We have a chef service we can offer to cook your meal; BBQ on our fabulous patio area and include if required, providing the food and specialities of varied cuisines and including clearing away after wards. For us, we just want our guests to relax immediately they arrive in our villa and have a memorable holiday with friends and family. toilet, shower, This has a walk in shower whith twin sink bowls. There are four 'walk in' shower rooms, one including a bath two are en-suites, all have his and her sinks and are finished in the latest designs of slate and marble with large mirrors embedded in the tiled walls; spacious showers with large shower heads. There are a number of lovey blue flag sandy beaches in Playa Blanca which are easily reached from our villa either by foot, taxi; cycle or car. In close proximity of our villa is located the beautiful red mountain called the Roja Mountain. This mountain is a great tourist attraction which provides a leisurely walk to the top of the mountain. We often walk with our grandchildren to the nearest beautiful sandy beach of Playa flamingo where there are a number of bars and restaurants to chill out with stunning views over the beach to the sea. Playa Blanca was once a small fishing village and has been transformed into a lovely friendly family town; many shops; restaurants spanning along a promenade to chill out and watch the world go by. From our lounge their are stunning views to the sea and to the island of Fuerteventura. The modern hand made solid wood kitchen is fitted with the latest leather style marble cream 'antibacterial' worktop. The appliances includes; oven; dishwasher, washing machine, fridge freezer, microwave, toaster, kettle; coffee pot and sandwich toaster. Scuber diving; sailing;water sports including hang gliding over the sea all within easy reach of the villa. There are two 18 hole golf courses; one is in Costa Tequese 40 minutes drive and one in Puerto del Calmen 30 minutes drive. There is also a good 'par three' golf course in Playa Blanca and is located near the Princess Yiaza hotel. Notes on accommodation: Included within the rates for hiring the villa are the use of cots; children’s highchair and pushchair. Hairdryers are provided in two of the bedrooms. The air-condioning unit also provides heating facilities to the lounge. All bedroom doors and windows are fitted with Aluminium windows or sliding patio doors incorperating shutters and fly screens to allow fresh air to circulate freely around the rooms during night and daytime. Smoking is not allowed in our villa Outside: Villa Coco sits on an area of land of approx 1100sqm and is fully detached with tropical gardens to all sides of the villa. When sitting on the patio areas you will notice how quiet it is, partly due to the space that surrounds it and the private and established Community it resides in. The extensive patio areas have been designed to provide two facilities; dining and relaxing 'Alfresco' style on the upper patio and pool side area with six sun loungers to enable you to chill out around the pool. The 'alfresco area' includes a marble dining table which sits near the large BBQ; a coffee/snacks area and a chill out area where you can enjoy a glass of wine seated in comfortable wicker chairs with large cushions. The two patio areas are separated by lockable gates provided to maintain a safe area on alfresco patio for toddlers to play and restricting their access to the pool area. NOW INCLUDING A POOL TABLE IN THE BEAUTIFUL GARDEN AREA so that the children & adults can enjoy themselves. Utility Room: There is a Solana outside including clothes line and area to dry clothes and store travel cases. There is also an iron and ironing board. Cleaning / Towels / Linen / Maid service: All of the linen including towels are provided on arrival with a weekly changeover for those staying two weeks or more. If you would like your linen changed, or the villa cleaned more frequently this can be arranged. Beach towels are not provided. Other: One of the bedrooms has been set out to provide a place for the children to watch TV or play on their computer games. The room has a large TV, Playstation 2, DVD equipment provided and is situated next to the patio so that clearly visible from the patio. The property was checked up on regularly to ensure that everything was to our satisfaction - garden, pool, cleaning - and to see if there was anything we needed. We would like to highly recommend the villa except we can't - we want to keep it a secret so that we can book it again next year. A brand new water park has just been opened which is only 15mins walk from our villa. Featering a number of water shoots; kiddies water shoots;swimming pools 'water river' and much more. There are a number of scuba diving schools in the area; large marina including a variety of boat trips around the coast or to ther Islands. In large sandy bay of Playa Dorado (Playa Blanca) there are number of sea sports activities including, water skying; power boating; sailing; surfing and a number of group activities eg banana boating; fly boating. There is a par three golf course, suitable for practicing your accuracy in golf shots. There is a good bike hire company which also rents electricall powered cycles. Within a thirty minute drive there is Go Karting; Off road quad biking; Horse riding school; Water park; Camel rides;Zoo and many other activities for those who enjoy an active lifestyle. Airport is Arricife and is 25-30 minutes away. There are many taxis at the airport. 'Playa Flamingo' beach is a lovely area for children in that it provides shallow water levels in a protected bay area of the sea and a sandy beach and is only a 15mins walk from our villa. There are a number of restaurants that sit on the promenade and provide fantastic views across the sea. Alternatively you can drive to these areas in a matter on minutes or go by taxi for a few euros. Playa Blanca, once a small fishing village, has in recent years been sensitively developed into a small town whilst retaining a lot of its old charm including a couple of the old restaurants. It is a place that benefits from the all year round warm Canarian climate. Many of it's shops and restaurants are open 52 weeks a year with many staying open until late in the evening. The relaxed atmosphere of Playa Blanca sets it apart from many holiday resorts and offers so much for those families who enjoy a warm climate, in that the local people are very friendly with most speaking more than one language which makes ordering a meal or shopping so much easier. For those who like shopping, there is plenty of variety from designer labels to tourist shops. There is a variety of restaurants to suit all tastes, many of them located on the shore line so you can both enjoy the views over the sea or just people watch. It is truely a family location; not load; not brash, with people from around the world, just calm where you feel safe. The new marina in Playa Blanca is stunning and boasts many good restaurants, classy shops, with markets held weekly on Wednesday and Saturdays. The hotels Princess Yiaza and Volcan near this area are five star and provided places to go for that special evening for a drink or to dine. There are also a number of restaurants that offer that bit extra when it comes to dining all are located within a relatively short distance from the centre of the village. There are four large supermarkets, two selling fresh meat; one selling fresh fish. There is also fish market near the harbour which sells fish that is brought in that day by the local fishermen; if you like fresh fish this is the place to go. Booking Notes: We normally seek a 25% deposit to secure the booking with the remainder paid eight (8) weeks before departure to the villa. We will require proof that holiday travel insurance is in place for those using the villa. The prices are generally for four people and you should add an additional £130 per person per week to this price. Four prices of £2,250; £2,400; £2,450; £2,550 & £2,600 these are for eight adults, please add a further £130 per person per week for any additional adults above eight to these prices. These prices are subject to change at the owners discretion. Groups of single gender under the age of thirty Years of age or 'stag or hen' parties will not be allowed to stay in our villa. Changeover Day: Flexible. The villa will be available to occupy from 3pm and normally we will require our guests to leave by 10am on the day of their departure by 10am. Notes on prices: A minimum deposit of £400 will be required to secure a booking with the balance of the payments due eight weeks before your departure on holiday to our villa. Cot & high chair included in the above prices. We will require proof of your comprehensive travel insurance extending for the whole perod of your stay in our villa.